Vera (Horton) Smallwood, 92 of York transitioned late Thursday night, March 21, 2019. She was the daughter of the late Cassie Horton and Lola (Charry) Horton. Born in Winston Salem, North Carolina 1 of 11 children; Vera received her Christian foundation from the St. Andrews AME Church of Winston-Salem, N.C. at a young age. She was formally educated in the Winston Salem school and attended the all Black Atkins High School. Vera worked at Shell Dry Cleaner, the Wepman family and she retired from Danskin in 1990 as an inspector. Vera served as a mentor in the Foster Grandparents Program through Community Progress Council and the York City School District at Hannah Penn Middle School and William Penn Senior High School. Vera was a true believer and follower of Jesus Christ. 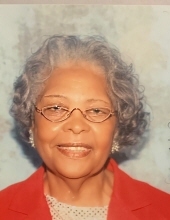 She joined Shiloh Baptist Church in 1963 where she served on the Senior Usher Board, the Manning Chorus, Deaconess Board, Culinary Committee, Advisor to the Junior Usher Board and the Altar Ministry, Chairperson for the Senior Ministry. She became Deaconess Emeritus at Shiloh in 2008. She was also a member of the National Baptist Association Convention & Central Baptist Association of Pennsylvania. She transferred her membership to Cornerstone Baptist Church on July 1, 2012 where she was a member when she was called to Glory. Vera leaves to cherish her memory her 2 daughters; Carol (Smallwood) Hartzog and Vera Elaine (Smallwood) Generette (McKinley) 2 sons; Charles H. Smallwood Sr. (Karen) and Douglas Smallwood Sr. (Yvette) and 2 sisters; Christine Michael and Ernestine Lawrey (Revernal “Bubba”) all of York, PA, a stepsister Florine Hampton, 18 Grandchildren, 65 Great-Grandchildren and 41 Great-Great-Grandchildren, a daughter-in-law Janis M. Rozelle, and a host of nieces, nephews, cousins and friends. Vera was proceeded in death by her parents, her loving husband Herman L. Smallwood Sr 2 sons; Herman L. Smallwood Jr. and William L. Smallwood 4 sisters; Lola Jolly, Catherine Jackson, Grace Stokes and Hattie Mae Studyvance. 4 brothers; LaFair “Jimmy” Horton, DeTroit Horton, Howard Horton and L.T. Horton, a son-in-law Theodore Hartzog. Vera’s special interest was reading her Bible, hospitality, feeding people and collecting hats. The Celebration of Life Service will be held on Saturday March 30, 2019 at Cornerstone Baptist Church 629 S. Pershing Ave. York, PA. 17401 The Rev. Mark Kearse officiating. Boulding Mortuary is handling the arrangements and interment will immediately follow the service at Susquehanna Memorial Gardens. To send flowers or a remembrance gift to the family of Vera Horton-Smallwood, please visit our Tribute Store. "Email Address" would like to share the life celebration of Vera Horton-Smallwood. Click on the "link" to go to share a favorite memory or leave a condolence message for the family.